We aim to please all your pets! 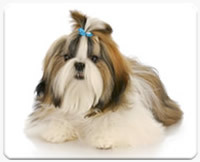 Grooming Includes all the following: Initial consultation with groomer consultation with your master groomer begins with an evaluation of you dogs coat and condition and your preference of cut. We offer over six types of natural shampoos including oatmeal, Hypo-allergenic, Flea, Whitening and others all designed to create a healthy and beautiful dog . You and the master groomer determine the right shampoo. All shampoos, even speciality shampoos, such as oatmeal, flea or even hypo-allergenic shampoos are included in the bath price. We never charge additional for specialty shampoos ( except flea dips ). 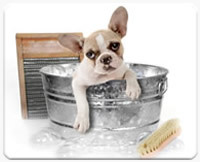 We give your pet what they need and all of our guests are double or triple washed to assure cleanliness. Our location is a state of the art facility designed with you and your pet's comfort and safety in mind. Our faciluty is clean and stylish, and it even clean -scented because of our sophisticated air purification system. The ears and eyes are cleaned and glands are expressed with natural cleaning solutions. The nails are clipped or grinded and smoothed. 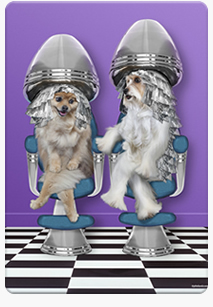 All dogs are fluffed and blow-dried by hand. Our establishment never puts your pet in a cage dryer . This is a more time consuming process but well worth it. Your loved one is getting the attention and quality groom they deserve. Prices vary according to size, coat and temperament. 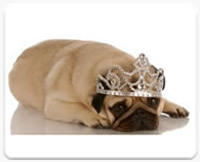 We are very competitively priced and use only the best , top of the line products at love my dog resort and spa.